Over thirty US municipalities have been pressured to adopt City of Refuge ordinances that prohibit municipal employees from requesting or sharing information about immigration status when providing city services. In Canada in 2013, after over a decade of grassroots community organizing and mobilizing across service sectors, the city of Toronto declared that all city services would be accessible to undocumented migrants and migrant workers. Hamilton soon followed suit in February 2014. Calls for a Sanctuary City have been made in Vancouver at the policy level and by service providers since at least 2005, but are now finally taking root with the leadership and persistence of grassroots groups like Sanctuary Health. Leading up to the municipal election, parties and politicians have also weighed in on the discussion. Vancouver as Sanctuary City: A City of Inclusion or Displacement? Tonight, Vision Councillor Geoff Meggs is hosting a campaign forum on how Vancouver can be a more inclusive city for migrants, including a discussion on Sanctuary City. But beyond the City’s sloganeering, political opportunism, and false promises accompanying every election lies a far more critical question about the City’s role in displacement, inclusion and safety for its residents. The same Councillor Meggs has recently been defending a proposal to increase fines for homeless and low-income people sleeping outside and for street vending. Tickets for minor bylaw infractions already place a triple-burden of criminalization on poor people in the DTES. DTES residents are most likely to be selectively profiled by the VPD for ticketing with 95% of all street-vending tickets in the entire city being issued to DTES residents; DTES low-income residents are least able to afford these egregious fines; and DTES residents are most reliant on survival economies such as panhandling and street vending. “The majestic quality of the law forbids the rich as well as the poor to sleep under the bridges, to beg in the streets and steal bread,” Anatole France said in the early 1900’s, remarking on the false neutrality of poor laws. By atrociously stereotyping and linking street communities to crime and public disorder, these so-called civility bylaws provide the pretext for gentrification’s removal of poor and homeless people – disproportionately Indigenous and of colour – from public space. Frequent ticketing blitzes in the DTES are just one part of the intensifying processes of policing and neoliberalism facilitated by the City. According to researcher William Damon, the Vancouver Police Department – notorious for over-prosecuting and under-protecting Indigenous women – has a $235 million police budget, the largest and fastest growing part of the city budget. Metro Vancouver’s Skytrain police budget has also grown to $31 million annually and is expected to grow 25% over the next few years. Mexican migrant Lucia Vega Jimenez, who committed suicide in December 2013 after one month of incarceration and a pending deportation, was initially detained by Skytrain police for an unpaid transit ticket. Skytrain police routinely collaborate with the Vancouver Police Department and Canada Border Services Agency to identify and detain people under the pretense of fare evasion. They are also the only armed transit police force in the country. Simultaneously, a series of intentional neoliberal policy decisions has made this city one of the most unaffordable in the world. Under subsequent municipal governments, renovictions have been facilitated, corporate developers have been incentivized, and calls for rent control have been ignored. All of these policies disproportionately impact Indigenous people, recent migrants, queer and trans communities, women fleeing violence, and seniors. For example, after a three year Low-Income Area Planning Process (LAPP) in the DTES, ostensibly framed as ‘engaging’ residents and community stakeholders (I was part of a group with a seat on the LAPP), the City approved a 30-year plan for the neighbourhood that includes 8,850 new condo units and 3,300 high income renters while dispersing at least 3,350 low-income residents out of the DTES. Furthermore, without a definition of social housing in the plan, let alone a guarantee that all social housing will be at welfare rates, ‘affordable housing’ becomes a hollow declaration and perfected media sound-byte. Despite Mayor Robertson’s oft-repeated campaign promise to end homelessness by 2015, Vancouver’s homelessness count has actually doubled in the past year. How can a municipal government that has recently approved a displacement plan for low-income DTES residents, overwhelmingly Indigenous and of colour, be entrusted to provide access and safety for displaced nonstatus migrants and refugees? This reveals not only the hypocrisy of the City government but also a logical fallacy. A city that cannot even provide the most basic human need of housing and shelter to its residents is, arguably by definition, not a city of sanctuary. This is further pronounced by the fundamental reality of Vancouver as an occupying city, one that has immorally and illegally built itself on the displacement of the Musqueam (xʷməθkʷəy̓əm), Tsleil-Wauthuth (Səl̓ílwətaʔ/Selilwitulh) and Squamish (Skwxwú7mesh Úxwumixw) nations. There will always be tension between democracy as the exercise of a shared power of thinking and acting, and the State, whose very principle is to appropriate this power. There have been four consistent lessons for Sanctuary City movements from various U.S cities as well as Toronto: declarations of sanctuary by municipal governments are only meaningful if they are accompanied by clear implementation strategies and accountability mechanisms; victories must be defended by our communities to prevent them from being rolled back; our political power lies in challenging, not appealing to, power; and zones of sanctuary are actively constituted not by politicians but by us – as service providers, educators, healthcare professionals, and neighbours – on the basis of solidarity and mutual aid. While the current iterations of Sanctuary City may appear novel, we can draw inspiration from a vibrant history of reciprocal relations that have been fostered amongst and between communities. I am reminded of the graciousness of the Musqueam who harboured Chinese migrants during the city’s race riots over one hundred years ago. And more recently of the DTES’s unsanctioned peer-run safe-injection site that courageously supervised over 3,000 injections in 2003 in the face of government inaction during a health crisis and HIV and Hepatatis C epidemic. 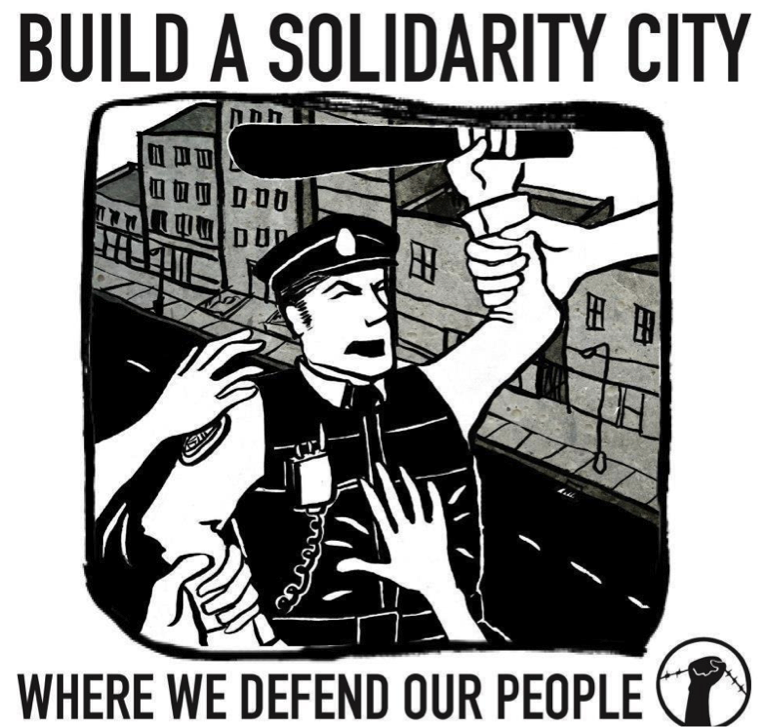 We build a Sanctuary City by dismantling the colonial, capitalist and oppressive city we live in, by enacting intentionally just relations with Indigenous nations whose lands we reside on, and by nurturing interdependent communities committed to Indigenous, racial, migrant, gender, economic, disability, reproductive, and environmental justice. Posted in Analysis, Immigration, Police. Bookmark the permalink. This content of this article is great, and I love the quote from Chowdhury at the end. However, it’s context is baffling. I can’t figure out if the author is poking fun at The Mainlander (i.e. : COPE), or has unwittingly given a political party some radical rhetoric? In any case, great message, but not an ideal platform.